Reconstructing a dataset of observed global temperatures 1950-2016 from human and natural influences | Climate Etc. A demonstration that multidecadal variation since 1950 leads to overestimation of the Transient Climate Response (TCR). Inspired by a recent paper ( Folland et.al 2018), I try to replicate the annual development of the observed global mean surface temperature (GMST) for 1950-2016 with a minimum of fitting and smoothing. Unlike it was done in Folland et.al I don’t want to break the time series into sub-periods nor use monthly data when annual data seem to be sufficient. Anthropogenic forcing. I use the forcing ERF data of Lewis&Curry (2018). ENSO, solar forcing, volcano forcing. 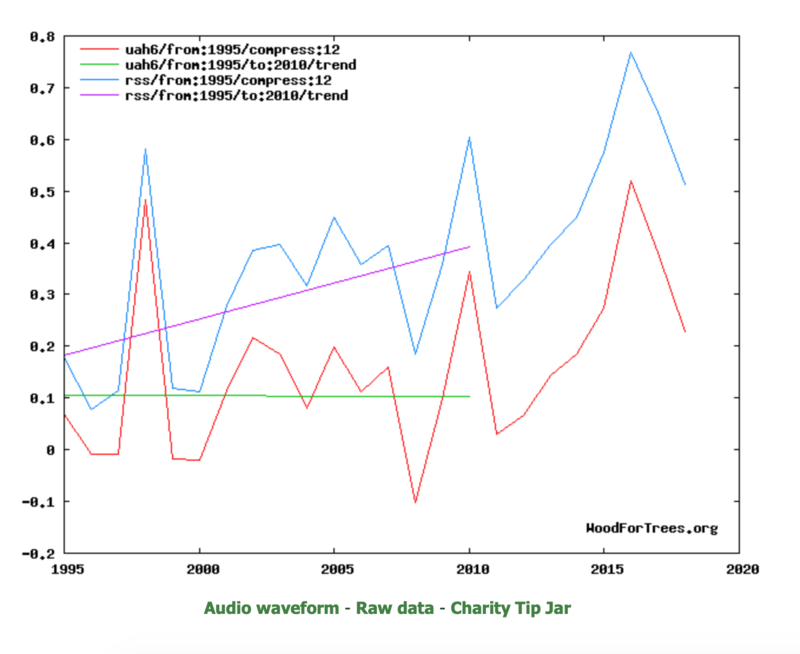 I use the data of Grant Foster aka “Tamino”, released in this recent post. Some internal variability of the climate system which is missed in modeled approaches as this very recent paper (Kravtsov et.al 2018) shows. The GMST product I use is the data source of Cowtan&Way as it is described here. The aim of the procedure is to show that one reaches an excellent agreement between the constructed dataset and the observations if natural influences are allowed for and human influence is parametrized as forcing multiplied by the sensitivity coefficients (i.e. the transit climate sensitivity) that is deduced from the observations. For the C&W dataset I downloaded annual averages for 1950…2016. Thereafter the data was passed the “Tamino- filter” (shown in fig.1 and 2 of the cited post) for eliminating the influences of ENSO, volcano and variations in the solar forcing. The data for this filter are available from it’s author here. The “filter” is the difference between the “raw” and “adj.” data. “Tamino” uses the index “MEI” for the tuning of ENSO- events, this introduces a trend slope into this filter due to the forcing impacting MEI. The thus adjusted data were regressed vs. the anthropogenic ERF data to estimate the sensitivity of the climate system vs. the forcing. The regression slope for 1950 to 2016 is 0.335 +- 0.031 K/W/m² (95% confidence). The residuals of this regression contain a (multi) decadal signal with strong persistence (Hurst coefficient=1) as will be shown below. The (multi)decadal variability is detailed modeled below. The impact of any forcing on the SST will be much more muted in these regions than in other regions of the globe because the surface warming power is mixed down into and has to warm a much bigger layer of water (Fig.1). Fig.2: The residuals (black) of the regression described in point 2 above and the SST- difference (light blue) between the North Atlantic (NA) and Southern Ocean (SO). Note that no smoothing was applied. The best fitting coefficient to map the residuals from the SST difference is 0.105.
where T is the reconstructed temperature and n the actual year of the record and tamino filter used as described in point 1 above I calculated T(n)for all years n 1950-2016. Fig. 3 compares the resulting reconstructed temperature series with the original Cowtan&Way data. Fig. 3: The original C&W data (green) and the reconstructed data with the procedure described above (dark blue). The difference of the trend slopes for the temperatures over the time 1950…2016 is marginally (4%). The standard error of the reconstruction is 0.008 °C. All the characteristics described in Folland et.al (2018) are replicated: the slightly cooling to 1976, the strong warming thereafter to 1998 and the somewhat muted warming to 2014, which is likely a result of the internal variability. 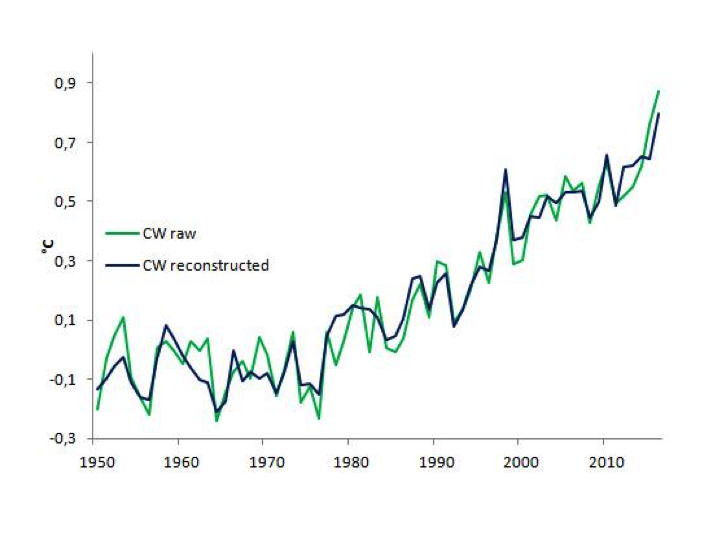 The overall performance: 94 % of the variance of the raw C&W data is deduced from the described reconstruction. The remaining residuals probably contain mainly weather noise (Hurst Coefficient=0.7). How much warming since 1950 is anthropogenic? The procedure gives 98% for this time window. The trend slopes with/without internal variability are indistinguishable. Fig.2 shows that the internal variability made an almost full swing during the 67 evaluated years. A postulate is included: There are no other contributions than described in the introduction section, perhaps longer lasting, so that we can’t identify them. This is also the case if we would include more years from the past, also due to the strong increasing uncertainties in the observed data, i.e. in the Southern Ocean. However, in shorter time windows the internal variability described here can for sure introduce some bias regarding the sensitivity. Fig.4: The linear amplification of the GMST trends from the internal (multi) decadal variability shown in Fig.2 with the start year on the abscissa to 2016. The internal variability (see Fig.2 and 4)”push/pulls” the observations in this manner. The higher trend caused by this (multi)decadal variability was likely taken into account when parameterizing climate models, introducing bias in them. Solar- , volcano forcing and ENSO- influence. The calculation follows here the cited “Tamino” post with thanks to Grant Foster for releasing the “filter”. Some (multi) decadal internal variability with the amplitude of about 0.25°C (see fig.2) which can be well modeled by scaling the SST difference between the areas mentioned. The (multi) decadal variability mentioned in (3) will lead to estimates of TCR based on trends over periods starting after 1950, particularly trends during the satellite period (post 1978), being biased upwards. The real issue that exists with this analysis is just how much Cowtan and Wray has been “adjusted”. As the analysis is not working with raw data, there could very well be an artifact from whatever C & W did with the raw data, and the analysis if finding the corrections, not reality. Debiasing is minimal in that time peroid. Meanwhile… global warming alarmists’ fears that our children would by now, never know snow again, seem deranged. 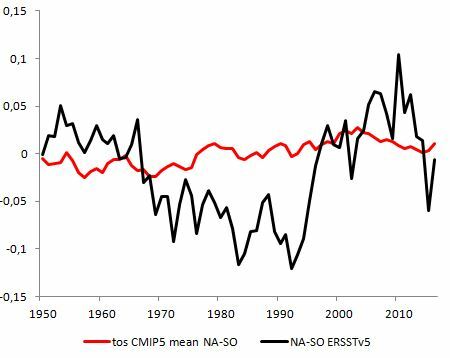 The NASA chart on Tamino’s article has mischaracterized the solar contribution, secondly, the MEI is a solar response, and lastly, the volcanic contribution has been partially confused with the solar response. I call this effort a complete stunning failure. Nothing personal. I am puzzled by an apparent failure to distinguish between the marginal effects of CO2 and methane on changing the degree of insulation, hence reducing the dissipation of solar energy, and changes in solar and other energy sources (ENSOR). Insulation acts to cumulate energy (just like a capacitor stores a multiple of the energy input per unit of time). What are the marginal effects on the insulation factor from the increase in CO2 and methane? 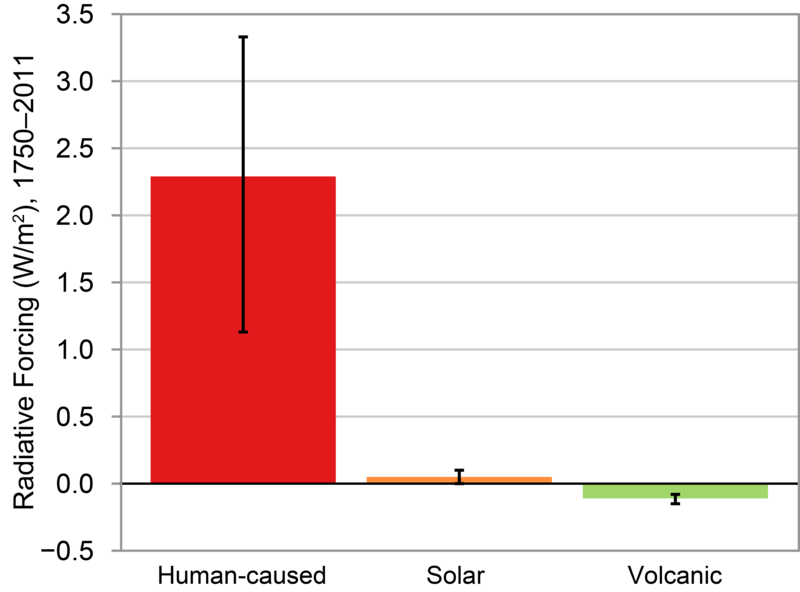 Just to create a purely hypothetical example, if one were to assume all the increase in atmospheric insulation only adds 0.1% to the cumulation of heat, but the ENSOR sources added .01% of energy, which through the cumulative effects of insulation adds 0.1%, then one could conclude that anthropomorphic causes are only about 50% of the cause of the temperature rise in recent times. Thank you. Very helpful. I am an economist/econometrician by training (1963-68) so, though stale in practice, I can spot foolishness in calculation, estimation and regression. It is non-scientific to make the calculation of ∆F as a residual, that is, the net effect of dozens of other variables, whether they are related to the dissipation (atmospheric insulation) of solar energy or not. You have made ∆T a relationship with a single regressor, i.e., an instrumental variable ∆F, as if it is exogenous. However, there is good reason to believe ∆F is itself a function of other independent and dependent variables. Econometricians struggle with this all the time and wish they con run controlled experiments. In addition, the estimation of ∆F used in these studies does not take account of the different linear and non-linear effects each of the non-specified (exogenous) underlying explanatory variables may have on the calculation of the coefficient on ∆F. I would have expected, and therefore wrongly assumed, that the insulating effect of H2O, CO2, CH4, or other gases, would have been calculated in the laboratory under controlled conditions. That is normal practice in science when trying to determine the insulating properties of many substances. For example, the insulating efficiency of building materials is expressed as an R factor. Its calculation controls for all other factors. I can now see why this is really ‘unsettled’ science. Welcome to the world of climate science. There is a lot of magical thinking involved and it gets deeper the more you dig into it. I’ve read papers where there are hundreds of estimates and assumptions but the authors seem to have supreme confidence in their findings. It is a world unto itself. But a tangential benefit is that when problems are pointed out or questions raised the ad hominem attacks begin. A joy to watch and one reason I took an interest in the issue, since 20 years ago I accepted the whole package of AGW. > I am an economist/econometrician by training (1963-68) so, though stale in practice, I can spot foolishness in calculation, estimation and regression. ∆F is the sum of the change in radiative imbalance at the top of the atmosphere determined for all “forcings”, mostly anthropogenic ones. In economics, all? inputs may be expressed in dollars, while in climate science W/m2 are the “currency”. In the real world, forcing is not uniformly distributed over the globe, so a global average forcing measured in W/m2 is a first approximation. Starting from the wrong assumptions one can only arrive to the wrong conclusions even if the methodology is correct. Tamino’s calculation for ENSO, solar, and volcanic forcing is a compendium of our ignorance. And it is to a certain extent a deliberate ignorance. We already know that the main effect of solar variability on climate is not due to TSI changes. Solar activity affects the angular momentum of the atmosphere during polar winters (there are two per year), and regulates meridional/zonal wind circulation, determining how much energy the planet loses at the poles during the dark polar winter. These are huge chunks of energy that can match in three years all the heat released by the 2015-16 El Niño and leave the CO2 effect in shame. Low solar activity explains the Pause. The missing heat hasn’t gone to the oceans, it has gone to outer space during the dark polar winters. The evidence is there for anybody interested. DMI has the seasonal temperature averages for 80-90°N. And as Bob says above, ENSO is under solar control. If we don’t know that is because we don’t want to. The evidence is absolutely clear. Less than 1 in 4000 probability of that being due to chance. Your conclusion that 98% of the warming since 1950 is anthropogenic is absolutely false. You are just playing by the rules established by the IPCC and its climatological cadre that climate change can be reduced to radiative forcing and nothing else, to make sure it can only be due to human causes. The reality is that the LIA was caused by low solar activity forcing the planet into a net heat-loss mode for hundred of years. The post LIA warming is not forced and is not driven by radiative changes. The recovery in solar activity put an end to the heat loss and the planet has been warming for centuries little by little without being forced. The warming will stop when the planet finds its equilibrium as determined by its present Milankovitch situation, and its current solar activity. This temperature equilibrium has been made higher by the increase in GHGs, but we don’t know by how much. Solar activity very clearly predicts that there won’t be any global warming until at least 2035. That will make for a 30-year long Pause that is incompatible with humans being responsible for most of the warming since 1950. If low solar activity can stop warming on its tracks, it is obvious that it also contributed to the warming when it was high. I support your statement at the 60% level of confidence. But then we need to make up for this shortage. Which would be Greenland and Antarctica’s ice melting. Or we could say the SLR is overstated. In any case, the accounting is weak. The data isn’t black and white enough. Too many assumption are used. So then we left with using a cartoon of the system. With high ocean to atmosphere joule transfer in Winter where humidity levels are low. So the accounting data is at the joke level. No climate scientist can say that we are 95% confident that the total joules in the oceans are within 5% of this number. This is a standard audit conclusion statement. Now the climate scientist can actually say the above. But, they need a much smaller number than the above 5%. Say for instance a 1% increase in the joules in the oceans provides a lot of SLR. In the case of a company like Google, 5% is close enough to base decisions on. In my climate example, the number is less than 1%. 3800 meters of average ocean depth. 1% equals 38 meters. (A 1 to 1 conversion is wrong, but you get the idea.) So what they need to do is approach such a small amount of the total as to make the problem intractable. They cannot count with the detail needed and instead make assumptions and fail to give error bars so as to call into question what they are saying? But like auditors, they are supposed to provide information that is useful to management. Which they aren’t doing. Because they so in the dark as the what the accounting statements say about things that are relevant. Relevant enough to spend or not many billions of dollars. They are not accountants. They are not accountants. They should not be referred to as such. They are no better than stock pickers. Those finance guys with the big houses and big boats. In yr beginning is yr ending. The core is that for sure one can identify the (multi) decadal variability for 1950…2016 and only with the including of those one gets a realisic T-record for this time window and the TCR is in real lower than models estimate, also with the arrived methods. I suppose you are unaware of the circularity involved. The TCR is derived from the whole temperature change, so when applied back it “explains” all the temperature change. That ain’t science. Javier, please be aware that in the result of the meanpost is not only the forced part is included. IMO you are unaware of the corepoint albeit I mentioned it in the meanpost and in the comment above. I think I understand what is involved in the study. This is just a repetition of IPCC reports. TCR assigns the long term warming to GHG increase. Long term ENSO is near neutral as Niños and Niñas cancel out, but provide interdecadal variability. Solar is neglected by considering only TSI changes that, already small, become tiny when averaged over the 11-year cycle. So 98% of the change is due to GHGs and land use. We already know that fairy tale. The problem is that it contradicts all the evidence from paleoclimatology on how climate changes, and it neglects any non radiative climate phenomenon. When extended to 1750 this thesis shows that natural climate change does not exist and only GHGs and orbital changes can change climate. As I said, this is deliberate ignorance. What happens if you apply this procedure to the satellite record? David: I guess it’s too short to deduce the internal variabiliy. At least 65 years of observations are to involve IMO. On the contrary, Frank. The sat record shows nothing but natural variability, specifically a step function coincident with the giant ENSO at the end of the century. There is no warming before that ENSO and none after, but the second period of no warming is about 0.3 degrees C warmer than the first period. Mind you I doubt regression analysis works with step functions, unless you do before and after separately. In that case you get a CO2 sensitivity of zero, because there is no warming in either period. There is also no long term natural warming, just the giant ENSO. Nor can the ENSO be “backed out” since it appears to be the sole cause of what little warming there is in the entire record. So I doubt this procedure works here. The incessant focus of climate “science” on the questionable surface statistics may be history’s greatest example of confirmation bias, or as I like to call it, paradigm protection. David: ” In that case you get a CO2 sensitivity of zero,” This is an indication that there is something wrong with your proposed method? Mine is not a method, Frank; it is a simple observation. The only warming in the satellite record is coincident with the giant ENSO. Given the nonlinear complexity of the climate system there is no reason to expect that the CO2 increase should have any effect and that is just what we see. I see a record with warming from 1979 to 2018 with a rate of 1.3°C/centrury but very more volatile vs. ENSO as one would await it for the troposphere with much less thermal inertia than the GMST. Mind you I doubt regression analysis works with step functions, unless you do before and after separately. Regression analysis not only fails to work with step functions. it fails to work with anything other than a static, memoryless linear relationship between excitation and response. In fact, it tacitly forces that assumed relationship upon the data. The climate system is nowhere near that simple, and attempts to explain its workings via linear regression are predestined to be misleading, at best. One waits in vain for “climate science” to grow up and embrace the well-developed methods of signal and system analysis (q.v.). BTW, while step functions can be useful analytic constructs, no physical system with any inertia manifests a response exactly of that form. Interesting discussion. I am trying to follow along with both sides of this discussion to learn. There seems to be a conflict in Mr. Weber arguing against anthropocentric change based on solar influence and Javier’s graphic showing a steadily declining peak solar incidence in the time period being discussed. 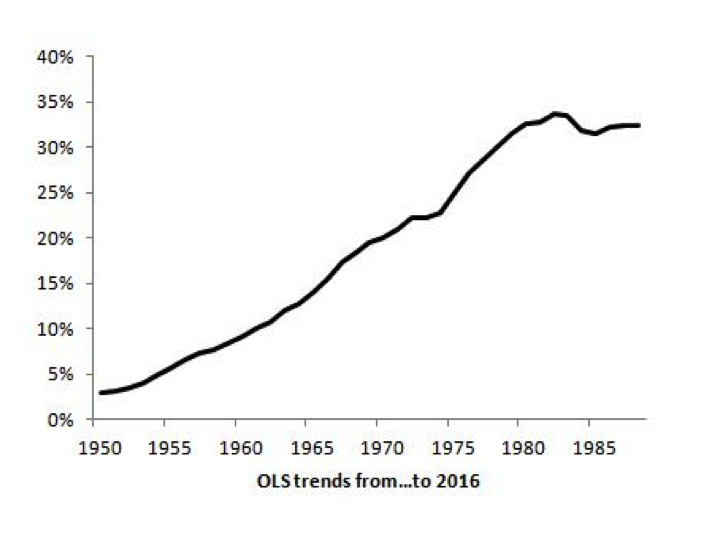 In other words, there is continued ocean warming but there is declining peak solar incidence to drive it. Am I missing something, or is there a disconnect between these two arguments? Not really. Solar activity is better measured by 10.7 cm solar flux, available since 1947, because sunspots are a semi-quatitative method that assumes a constant sunspot number/area relationship that is not true. This is the smoothed 10.7 cm solar flux with a 3rd order polynomial fit calculated since 1947, although it was plotted from 1958 for other reasons. As you can see solar activity has declined in the 21st century. It was very high during most of the 20th century when all the warming took place. There is some border effect at the beginning and end of the series, but it is clear that the decline in solar activity is taking place in the 21st century. There was a small dip in activity in the late 60’s to early 70’s, that also coincides with another period when there was no warming. Javier, in your graph you show that the solar activity declined since about 2000. If this would have a remarkable influence on the GMST and the GMST increased since than by about 0.35 °C( ENSO filtered) … how much bigger must be the influence of ERF anthropogenic on the GMST in this case to cancel out the solar cooling? There hasn’t been any warming since 2001 that can be related to an anthropogenic origin, since the only warming that took place was due to the 2015-16 El Niño, and CO2 could not possibly be involved in moving heat from the subsurface tropical Pacific to the atmosphere and the outer space. Nothing has cancelled solar cooling. The big El Niño has a net effect of heat loss to the system, so it is part of the cooling. On of the problems is that a lot of people is unable to get past the numbers to what the evidence really means in climatic terms. El Niño cools the planet. That’s why there were no Niños during the Holocene Climatic Optimum and they have been increasing during the Neoglacial. El Niño is a faster way to get rid of the heat accumulated in the Pacific. A heat that has a solar origin. The ENSO filtered data is rubbish. You can’t filter the ENSO effect. El Niño heat takes a very long time to move through the system and can find temporary accommodation in other part of the system. If you are familiar with the definition of Work, that is measured in Energy units, if you end at the same place where you started, no effective Work has been realized. Temperature changes are the result of Enthalpy changes, that are also a measure of Energy changes. If you end up at the same temperature where you started, no effective warming or cooling has been realized. I am told that a 0.1°C is not significant and within methodology uncertainty. So it can be said, that in those 17 years no effective warming has been realized. Hence the Pause. If I am correct, the same is going to take place for the next 16 years, and the Pause is very much alive and could turn into significant (i.e. >0,1°C) cooling. and from your graphic one would await cooling due to lower solar activity. My question: why didn’t it cool? Everybody with the opinion that the solar forcing has more impact than the forcing data say has to acknowledge that the SC24 ( since 2008) was the weakest cycle since SC6 ( this was around 1815) and the GMST didn’t decline since SC23. This is without any doubt IMO. So you are left with the question: what is the source of this warming? The only possible response: The anthropogenic forcing has much more impact on the GMST than used the original forcing data. Which means: more sesitivity!! This is the wicked problem of all “it’s the sun stupid” fellows. I’ll stick to my guns. HadCRUT4 doesn’t show it and I am not interested in yet another discussion about the goodness of datasets. HadCRUT4 is good enough for IPCC and good enough for me. This just show what are your assumptions about how the Sun affects climate. If you tell me your assumptions I’ll tell you your conclusions, that doesn’t mean they are the right ones. If you were to read a little more paleoclimatology you would know that the effect of low solar activity on climate has a significant lag. I recommend Takuro Kobashi. That’s the main reason a single solar minimum has very little effect on climate. You start to see the effect after a low cycle (now), and more intensely after two low cycles (20-year lag) when the lost energy starts to have an important impact even during summers. Meanwhile in the short time of low solar activity we are having since c. 2005, of only 13 years, its effect has already quenched the entire effect of the increase in CO2 for that period (c. 28 ppm), plus the heat released by one of the strongest Niños in recorded history, since unlike what happened after the 1998 El Niño, no step warming has taken place afterwards driven by a strong La Niña. As there is little heat left to be released from the Pacific, now comes the cooling. No global warming is possible for as long as solar activity remains below average. There are more than two sides here, Paul, as usual. I don’t understand why you said this Javier. If you wish, feel free to contact me privately by email, my address is on the lower right corner. I’ll write an article about it in the future so I can show the evidence, but the effect of solar activity on climate is asymmetric. Low solar activity has a disproportionate effect on climate, much larger than high solar activity. That is the reason why there are no warming Abrupt Climate Events (ACEs) during the Holocene. Not a single one has been identified and named. By contrast there are about 10 cooling ACEs identified. Climate change is also asymmetric. Obviously such asymmetric effect cannot be due to linear changes in TSI. The mechanism is partially identified and acts at the atmosphere level, not at the sea surface level. It may be mediated by ozone from changes in UV. It is surprising that the cooling bias of Holocene ACEs has not been given any attention. Solar variability may bias the system to one state or other – but a focus on one driver of polar annular modes is misguided. AGW is one of these drivers and collectively they result in AMOC and ice sheet feedbacks. Javier: An volcanic forcing is the perfect reason for abrupt cooling events in the alleged absence of abrupt warming events. Wasn’t the 97/98 an abrupt warming event? Given the stratification of the ocean – a warmer, less dense mixed layer floating on a much colder deeper ocean – the ocean become more unstable in the presence of surface cooling and more stable in the presence of warming. 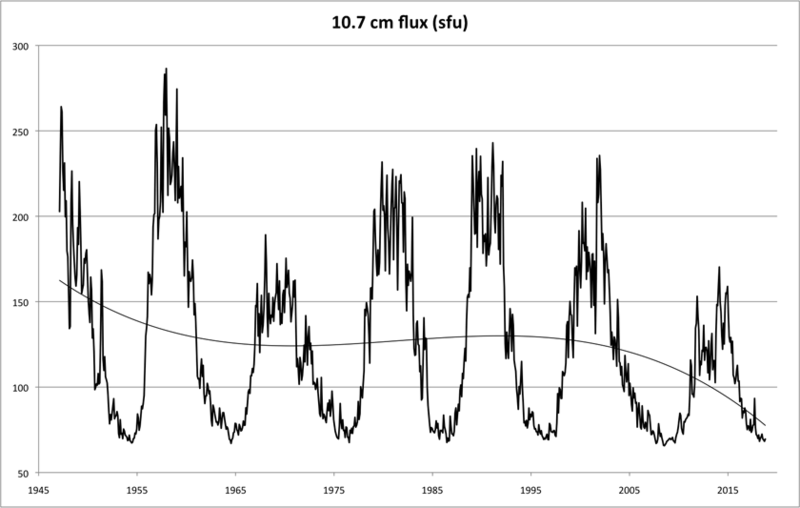 The F10.7cm solar radio flux data indicates 57.1% of days since 1947 were below my solar flux ocean warming threshold of 120 sfu, during the top cycles of the modern maximum in solar activity. When you look further back with v2 SSN as I did in Fig. 16 of my poster, you can see there were times since 1818 during lower solar activity associated with cooling, when there was a larger disparity between the sum of zero sunspots days versus the overall sunspot number average as compared to modern maximum years. If we had F10.7cm data since 1818 the number of SF days <120 sfu would've fluctuated to a higher percentage. Using this as a guiding principle, when we look even further back in time to cold epochs and ice ages, it doesn't take much imagination to envision long periods of low activity where the percentage of days under the warming threshold nears 100%, explaining the source of the cold, like the Maunder Minimum. The key factor is duration under TSI extremes. The sun controls the ocean, which controls the atmosphere, in that order. Bob, You have just discovered one of several solar mechanisms to affect climate. There are more. Solar effect on the Pacific Ocean energetics affects weather and climate, but its effect is limited. Solar activity oscillations are periodical, yet we have evidence that during the Holocene Climatic Optimum El Niño activity was very low. So ENSO depends on solar TSI, but also depends on the latitudinal temperature gradient. And the latitudinal temperature gradient depends on the solar insolation gradient. The insolation gradient depends on Milankovitch orbital forcing, not on solar activity. The effect I am talking about only takes place during the three winter months, and only when solar activity is low. Not average activity, not high activity. It is clearly an atmospheric effect that does not come from the oceans, and that affects the speed of rotation of the Earth. As low solar activity only takes place during 3-4 years out of 11, the effect doesn’t usually accumulate and is difficult to notice. Only when several low solar activity cycles take place in succession does the effect accumulate and the planet starts having more frequent cold winters and cooling. The effect of this mechanism is a lot stronger than the effect of TSI over the Pacific. It is the main contributor to the Little Ice Age. coolclimateinfo: When I have it correctly you state, that (above normal) durations of very low SSN activity shall trigger climate cooling events. One of the longest minima ever observed was in 2007… 2009 ( SC23-SC24 transition) with very low activity for 36 month in a raw. From 2007 on the GMST increased by about 0,1 °C (ENSO filtered) . How much stronger must be in this case the ERFanthropogenic to cancel out the “solar cooling”? What were the approximate dates and duration of these 10 ACE’s? There should be probably one or two more from the 2.5-0.5 period. There’s bibliography on most of them, but not on all. People tend to study just the 8.2 and the LIA (0.4). There are 3-4 types of events. By far the most common one is characterized by cooling, wetter Middle East, weaker Asian Monsoon, decrease in methane, increase in North Atlantic iceberg activity. This is the low solar activity pattern. The 8.2 is a type of its own, characterized by cooling, wetter Middle East, weaker Asian Monsoon, and super decrease in methane, but no increase in iceberg activity. Caused most probably by the meltwater pulse from Lake Agassiz. Another type is characterized by moderate cooling, extra-drying of the Middle East, little to no effect on the Asian Monsoon, and no increase in North Atlantic iceberg activity. I have no idea what causes these ones. The 4.2 kyr event is very similar to this type, but could be a type of its own, as it has a unique signature in several proxies from the Indian Ocean Area (East Africa, Arabia, West india). I think this one could have been an impact. Just to ensure I understand your nomenclature can you confirm that 0.4 means around 1600AD? The temperature definitely declined around 1560 and was generally, but not always cool until around 1700. What would be the mechanisms by which warm periods would interrupt the cool ACE? 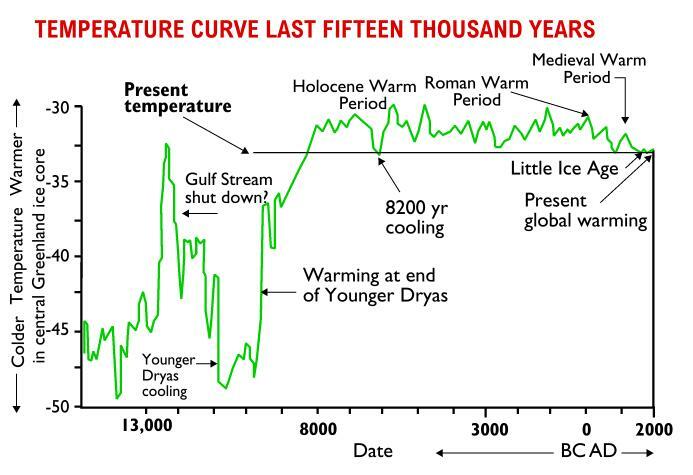 There were certainly extended cool periods around 1200 and around 550 to 650AD. How would it be determined if they were affected by a cool ACE? Tony, the dates are kyr BP (before 1950). 0.4 corresponds to the entire LIA, centered around 1550. The LIA is considered a single ACE, as we lack the resolution to identify warm or cold decades throughout the Holocene. Multiple proxy reconstructions, like Moberg et al., 2005, or Hegerl et al., 2007 support that from c. 1200 to c. 1650 there was a discontinuous period of cooling, and from c. 1650 to the present a discontinuous period of warming. While we could subdivide the 0.4 ACE (aka LIA) in smaller warm and cold periods, we lack the resolution to do the same with other ACE. I did not invent the term ACE. It refers to periods of clear climate change identifiable at the centennial resolution that lasted for a few centuries. Sorry for being OT, but I tried to locate your posts on Sea Level Parts II and III that were referenced in Part I several years ago. If you have it could you provide the link here? I searched but to no avail. Thanks for all that. As you may remember I reconstructed CET from it’s official start date of 1658 back to 1538 . As you can see I termed it the ‘ intermittent little ice age’ which is fairly close to your word ‘discontinuous’. Figures 1 and 2 might be of particular interest as they provide good resolution as opposed to the coarse sieve of more general reconstructions. The warm spells around 1640 are interesting as is the very cold spell around 1680. In general we have come to think of the LIA and the MWP as either continuous cold or continuous warm, which does not help our understanding of climate. There were some very warm spells in the LIA and some very cold spells in the MWP. So intermittently, discontinuously or characteristically warm or cold better reflects both the periods. ace is interesting. Is there data for the warm ones? It is obvious that there weren’t 400 years of warming, but the general trend has been up. There have not been any known warming ACE during the Holocene. Once the Holocene Climatic Optimum was reached the ACEs are all characterized by cooling followed by recovery. Once the Neoglacial starts the recovery phase, that is usually partial, might be mistaken with warming if out of context, but temperature doesn’t usually reach previous levels, so they have to be categorized as recovery. 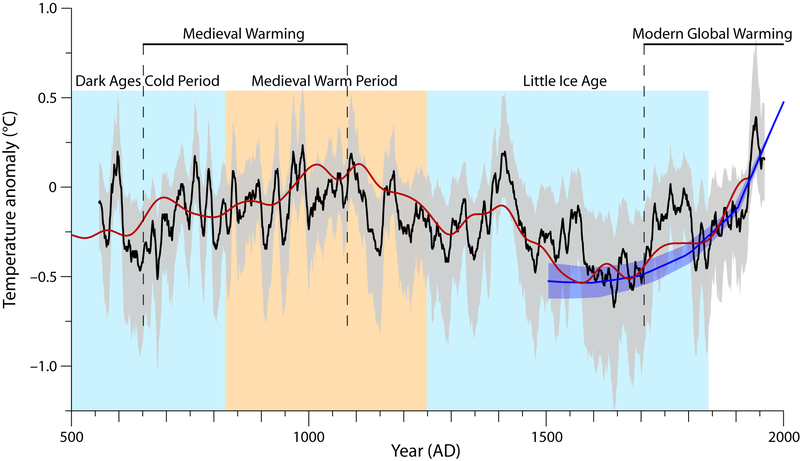 The possible exception is the present global warming that might have exceeded the Medieval Warm Period due to the anthropogenic contribution. In any case no warming Holocene ACEs are found in the bibliography to my knowledge. Holocene climate variability is essentially a study of cooling events. Such a strong bias in climate variability has not been properly addressed to my knowledge. Thanks Tony. Good to know it wasn’t my lack of skills in finding things on the Internet. I’m looking forward to when you do finish it. Events are particular instances of abrupt climate change. Javier is in the grand skeptical tradition of novel Earth system science – but I find these hypothetical enthusiasms less than convincing. AMOC seems involved in warming and cooling in the Northern Hemisphere. That changes for multiple reasons in a coupled system. This is still a good place to start. I find these hypothetical enthusiasms less than convincing. And that is your problem. You guide yourself by your opinion instead of by the evidence. Wanner, H., Solomina, O., Grosjean, M., Ritz, S. P., & Jetel, M. (2011). Structure and origin of Holocene cold events. Quaternary Science Reviews, 30(21-22), 3109-3123. Perhaps you could point me in the direction of a study on one or several warming events during the early or middle Holocene. There are lots of studies on cooling events, you would think that if you are right there should be some on warming events. From the conclusions in Wanner et al., study above. You not only display a strong bias yourself, but you try to disguise it in vain behind ad hominem attacks against anybody with a different opinion. The Younger Dryas and the 8.2 KY event? There is quite obviously warming and cooling – abrupt climate change internally generated – seen everywhere and at all scales. And I showed evidence of that and discussion of complex causality. Do you need more – or is that enough for you to ignore utterly in favor of personal disparagement? You have a list and an idiosyncratic interpretation – your hypothetical enthusiasms that brook no doubt or disagreement ever. I of course have profound doubt about all your habitually oversimplified notions you are so adamant about. Where have we heard that it is all in irrefutable data? Oh right – just about everywhere. There was a tweet feed on top that you should look at. YD was a cooling period outside the Holocene and within deglaciation warming. And 8.2-kyr ACE was a cooling event as even kids know. Zero examples so far. It shouldn’t be so difficult to come up with known Holocene warming events, should it? Let’s see… Preboreal oscillation? No, that was a cooling one. Boreal oscillations? No, those were cooling ones too. The 9.3-kyr event? No, a cooling one too. The 8.2-kyr event? Another cooling. The 5.2-kyr event? No, that’s the cooling one that froze poor Ötzi. The 2.7-kyr event? Damm, another cooling one. Hey it’s more difficult that it looks. I bet you thought there were as many warming events as cooling events. Yeah, that’s what chaos would predict. Equal probabilities and all that stuff. But that is not how climate works. You are being quite odd. The Holocene optimum, the Minoan warm period, the Medieval warm period and the modern max? Abrupt climate change – warming and cooling. A chapter of this was linked above because it is still a great starting point. If you read more widely before jumping to conclusions it wouldn’t be hypothetical enthusiasms I suppose. Abrupt climate change – warming and cooling. Not in the Holocene. In the Holocene it is cooling and warming. The warming comes after the cooling as recovery. You have no idea what I am talking about, have you? Those are not events. They are periods. And each one cooler than the previous so they came after more cooling than warming. It is quite obvious that there is abrupt warming and cooling. Yet you have not mentioned a single abrupt warming effect during the Holocene that has been studied in the literature. Your capacity to ignore the elephant in the room is really big. And you are confusing random change with deterministic chaos. From Wikepedia – but show me something that doesn’t have warming and cooling. To only have cooling seems scientifically oxymoronic. Ahh, again going the wrong way. We are talking global or hemispheric multi-centennial events, not Central Greenland temperature. 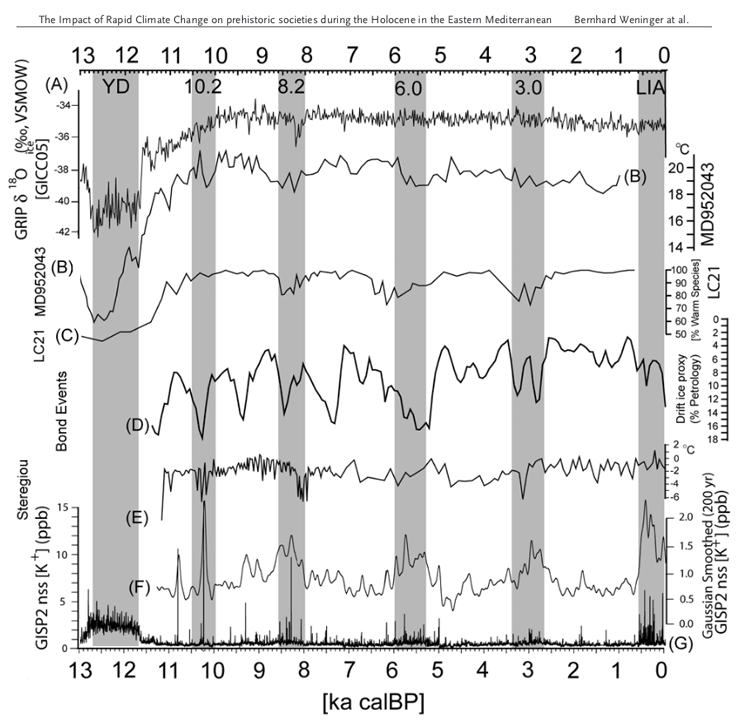 GISP2 is not a good record of Holocene variability. This is just one of the lines of evidence presented. They all show warming and cooling obviously. Thanks for reminding me of that article. Some seem to want to deny the existence of the long slow thaw. It far predates the current agw scare with it’s up to 400 year long epoch, It is a shame that it s not accepted more widely and the overall reasons for it more closely examined. These include Natural variability including aCe, volcanoes, currents, the sun and the colder period impacting on sea temperatures. Then there is the Man made elements which includes Land use changes, greater pollution first impeding the sun then as it was tackled allowing more sunshine, population increase and uhi, co2 etc. So many interesting possibilities yet we seem to want to make one element guilty of everything. we seem to want to make one element guilty of everything. Climate has a high level of short term noise arising from complexity generated chaos. But to move in the same direction for hundred of years in the midst of so much internal variability, requires a long-term external forcing. Several such long term forcings exist, from igneous provinces, tectonics, orbital changes, greenhouse gases. They are not difficult to conceptualize. Therefore, yes. Sometimes one element is guilty of driving climate in one direction for a long time. There is one such element that is not accepted. Long periods of very low solar activity can cool the planet for hundreds of years. The evidence is surprisingly strong, but even more surprising is how strongly it is denied by all except paleoclimatologists. The LIA was such a period. Its cooling was driven primarily by low solar activity and took place during the winter months (both hemispheres) of certain years. The recovery from the LIA has taken place once low solar activity ended, and has been mostly unforced, as there is an optimal temperature solution that corresponds to the current Milankovitch orbital situation. To that natural unforced warming, anthropogenic forcing has been added. That’s why the cause is not being found. We have no modern experience with the effects of very low solar activity (just getting a primer), and since the warming was unforced, no other forcing but anthropogenic is found. The cooling into the YD actually took awhile. The warming out of YD was, well, there’s a word for it. Trying to think of it. Oh yeah, abrupt. It was abrupt. With Milankovitch – it is AMOC, runaway ice sheet and no doubt other feedbacks. At other times it is cloud, dust, rainfall, vegetation and sea ice responding to chaotic shifts over decades to millennia in ocean and atmospheric circulation and modulating the global energy budget. 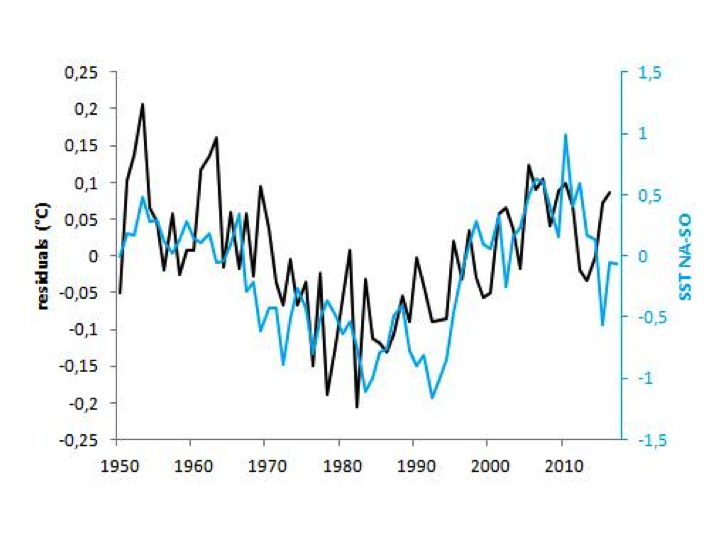 This hides the assumption that solar variability effect on climate acts through changes in TSI. Assumptions are a dangerous thing, as they are invisible but can make it impossible for you to get to the correct answer. These are the type of unsupported positions that make it impossible for you to understand what is going on with climate. The NAS has the same problem as the IPCC, they took a position before there was sufficient evidence to support it, and since they are trying to defend it with a strong bias towards evidence. Solar variability is too small to have much of a direct effect. This is very evident your narratives notwithstanding. How ignorant. UV, solar wind, solar magnetism, and some effects on Earth, like cosmic rays, stratospheric temperature, the size of Earth’s atmosphere, and ozone, show much larger variability than TSI with the solar cycle. I feel sure I said direct effects. UV may vary more than other solar frequencies but the power in this band is minuscule. What is needed – as Palle et al 2007 said in the quote provided earlier – is an internal amplifying mechanism that modulates Earth albedo. At the core of the Earth system is dynamical complexity – hard to explain to those for whom it has not clicked. Javier ties himself in knots trying to explain things in ways that can provide no explanation. And he resists the one idea that can. I repeated this earlier. But apparently both this committee of illustrious scientists and I have leaped to poorly based conclusions. its funny how CERTAIN ya’ll are about time periods in which there is no actual data, or precious little to speak of. There’s some uncertainty about their magnitude and exact timing, and a profound lack of knowledge about their causes, since GHGs were not involved. Certain, indeed, of the opposite of what the precious little data actually shows. From the epistemic overconfidence thread, natch. The evidence comes from oxygen isotopes in ice cores, ice rafting debris, sediment cores and temperature sensitive organisms, etc. The usual suspects. And abrupt climate change is how climate changes. Javier’s wild tangential enthusiasms notwithstanding – abrupt change is the result of tremendous energy cascading through powerful subsystems. Dynamical complexity at the core of the Earth system. frankclimate: And in the end the discussion is about some hypothetical impacts of “unicorns” on the GMST. You are more credible without the “unicorn” canard, so to speak. Yes the mechanisms are hypothetical but they are not impossible and they are worth investigating. Matthew: perhaps it’s a missunderstanding.. I meant with “unicorns” some effects not ot measure (in a physical way up to now) influences on the GMST. You can also call it: unknown unknowns. However, if one can’t measure it and is not informed about the uncertainties NOW, it won’t help. I agree with Frank that the solar thing is a distraction from the main post. frankclimate: However, if one can’t measure it and is not informed about the uncertainties NOW, it won’t help. Consider the fluctuations displayed in RIE’s Temperature Curve Last Fifteen Thousand Years: Would it help to know what caused the fluctuations? Whether the causes have persisted or recurred? Whether they were active since 1950? Whether they were global in extent? The effects can’t be estimated from short time series of data, so they can not be included in your modeling. That does not mean that they are not active and important. If they are, then your CO2 sensitivity estimate is an over-estimate by a currently inestimable amount. Javier emphasizes the possibility of quasiperiodic changes in forcing. RIE emphasizes the possibility that the fluctuations result from the natural dynamics of a chaotic system with (near) constant forcing. Mosher (seemingly) denies the relevance of thinking about them. Matthew: “hat does not mean that they are not active and important. If they are, then your CO2 sensitivity estimate is an over-estimate by a currently inestimable amount.” i agree. It would reduce the TCR more than I can estimate without those influences. BUT: The estimated TCR is also without these ” unicorn” inluences well below the best estimate from CMIP5 on the ground of real and reproducible data. Is it helpful to point to NOT reproducible lower sesitivities or is it better to take what we know for sure? I tried to point out what is known, not what could be estimated. Sorry for this. You can call them unicorn influences, but that doesn’t make them any less real. Literally hundreds of paleoclimatologists swear by their evidence that solar variability has a very important effect on climate. This is ignored because we have had over two hundred years when most of the time solar activity has been above average, so we have little experience with low solar activity and none with modern instrumentation. Ignoring such important unicorn means that any conclusion we obtain is wrong. There is no other way around it. You can’t calculate climate sensitivity without properly accounting for every important forcing. Well yes Javier, there have been large climate changes that cannot be attributed to greenhouse gases and current thinking is that changing PATTERNS of solar insolation is responsible along with strong feedbacks. I seem to recall that changes in the far north can amount to as much as 75 W/m2 locally. That’s a very large change. However, these patterns change slowly over time. To have much effect over the last century you would need some other mechanism such as an effect on clouds. and those changes DO NOT exeed a solar forcing delta of about 0.25W/m² on the TOA. And this negligible changing is reason enough to hijack every comment section of natural variability and other forcings? I do not agree! Then Frank, if it is so small, how do you explain that it changes the speed of rotation of the Earth? Le Mouël, J. L., Blanter, E., Shnirman, M., & Courtillot, V. (2010). Solar forcing of the semi‐annual variation of length‐of‐day. Geophysical Research Letters, 37(15). I checked it myself, and it is true. The obvious explanation is that it affects wind patterns in the atmosphere so much as to change the Atmosphere Angular Momentum. And the zonal/meridional wind balance controls how much heat is moved through the latitudinal temperature gradient, particularly in winter. How many W/m² equivalents is that change? Well, if I were to change the speed of rotation of the Earth, as Superman did in a movie, I bet I would need quite a lot of energy. Yet the Sun appears to do it when it is less active (notice the scale). The unknown unknowns that can kill your pet theory are huge, but you are not happy that someone tries to show you where some of them are. However Frank, it appears its gone up about 1 W/m2 since the little ice age. That’s significant. From what I read I think your work was pretty solid, I’d want to go over it a few more times though. The issue is the venue. Cranks will always find a way to Hijack a discussion onto the one streetcorner of science where they have their own branded misunderstanding. I use to tplay this game where I could take any conversation and turn it into climategate. For a mosh who fails to understand sensitive dependence in models – the complex dynamical geophysics of atmosphere, biosphere, cryosphere, hydrosphere and lithosphere are beyond his game playing skill set. frankclimate: I tried to point out what is known, not what could be estimated. Sorry for this. My objection was to the use of the pejorative word “unicorns” for what are defensible hypotheses about variables omitted from your analysis (effectively treating them as zero, when they are not in fact “known” to be zero). That is what you should apologize for. So I would for sure appologise if there would be something. frankclimate: So I would for sure appologise if there would be something. I think you missed my point, so I’ll drop it. Thank you again for your essay. Steve, thanks for your attention of this small article. I know you are a “data junkie” ( in it’s best meaning relating to transparent scince). I linked all the used data and if you are moreover nterested in my sheet with all the calculations…let me know it. Steven Mosher: From what I read I think your work was pretty solid, I’d want to go over it a few more times though. Frank Bosse: A postulate is included: There are no other contributions than described in the introduction section, perhaps longer lasting, so that we can’t identify them. This is also the case if we would include more years from the past, also due to the strong increasing uncertainties in the observed data, i.e. in the Southern Ocean. All Javier and RIE did was attempt to stimulate Frank Bosse to address their hypotheses about the admitted omissions. I liked Frank’s “for sure” part, though he seems actually uncertain. ALL they NEED to do is the following. But they will never do the work. They will NEVER EVER share data and code. Javier is the master of cut and paste science as is RIE. same old charts, same old cherry picked crap. Not for those that refuse to understand, or can’t understand, that’s for sure. My comment showing that solar forcing affects the speed of rotation of the Earth during winters has only received silence. Most people simply reject what they can’t understand. Scientists, at least the real ones, are supposed to embrace and relish on what they can’t understand. But what would you know. You aren’t a scientist despite all your lessons about how to conduct scientific research. I ain’t got any data or code that isn’t publicly available at one click distance. You keep asking for what I haven’t got. The angular momentum of the planet does change with changes in ocean and atmospheric circulation – there are a number of studies. What is more interesting is the physical linkage between solar variability and ocean and atmospheric circulation and the effect on TOA energy flux. I have provided multiple reference on these questions on these posts and suggest that regressing ENSO against temperature as discrete events is an incorrect procedure. There are a couple of other comments at the bottom. This is all mainstream science and what is a broadly held – by illustrious climate scientists – and more complete paradigm of Earth system behavior. Mosh in this zombie thread on the other hand is in wingnut territory offering nothing but his rote denial, sophistry and disparagement. So we must conclude that the ocean and atmospheric circulations change with solar activity. You can’t explain that with changes in radiative forcing due to TSI variability. You need a specific climate mechanism that amplifies the signal. If solar activity recruits internal variability mechanisms into forced change its effect can easily be several times higher than the effect of radiation changes alone. Do you agree with Frank that CO2 sensitivity is overestimated? For sure? The reason the correlations aren’t higher is due to irregular solar activity. I’ll be busy today with other things and will return over the weekend. Sorry about the huge image size, it was made for a 4’x6′ poster. Please note in the image there is a solar cycle onset El Nino, followed by La Nina, then El Nino(s) due to the build-up of solar energy at the top of the cycle, with lags. Try it this way. Start with a simple natural variability that explains the most of the change. Then apply the volcanoes and such, ending with the CO2 increase explaining the residuals. I suspect you get a very different answer. David: I would do so if we would know nothing about forcing, But some generations of scientists spent their time in research about it. However, I used the best available data for the ERF and the GMST and mentioned the sources. You are free to make a different approach. Frank: We know a lot about what a small forcing does in a complex non-linear system. What it often does in counter intuitive. What is seldom does is manifest itself in a simply linear way, which you seem to assume. It is your procedure so I am simply asking you to try several variants. The first is on the satellite record. The second is on the surface estimates with natural variability leading. These seem like simple requests. Think of them as sensitivity analyses. So “forcing” is the new rectifying, faking, fudging, counterfeiting, altering and varnishing of data so the forcer sees what he wants to see? Orwellian! No forcing is real enough, but it is just a small part of the equation of change. For example, the forcing of gravity will cause a feather to fall as fast as a cannonball in a vacuum. But on Earth the feather will not do that. If the wind is right it might even go up, not down. And so it is with CO2 forcing. Why did you use 3.8 W/m2 for CO2 doubling. In the Myhre CO2 forcing formula 5.35 ln(2) is 3.7 W/m2. Hi Hans, I followed the latest available data regarding the CH4-forcing which was uplifted vs. AR5 and the forcing for 2*CO2 was also uplifted to 2.8 W/m². 3. how that modulates the planetary energy budget? Patterns in the Earth system are perturbation – greenhouse gases, solar, orbital variability – induced regime shifts in quasi standing waves – ENSO, PDO, AMO, AMOC, PNA, IOD, etc. – in the infinitely coupled spatio-temporal chaotic flow field of our spinning nonequilibrium planet. It evolves as perpetual change in regimes at decadal to millennial scales. At a decadal scale in the modern era? 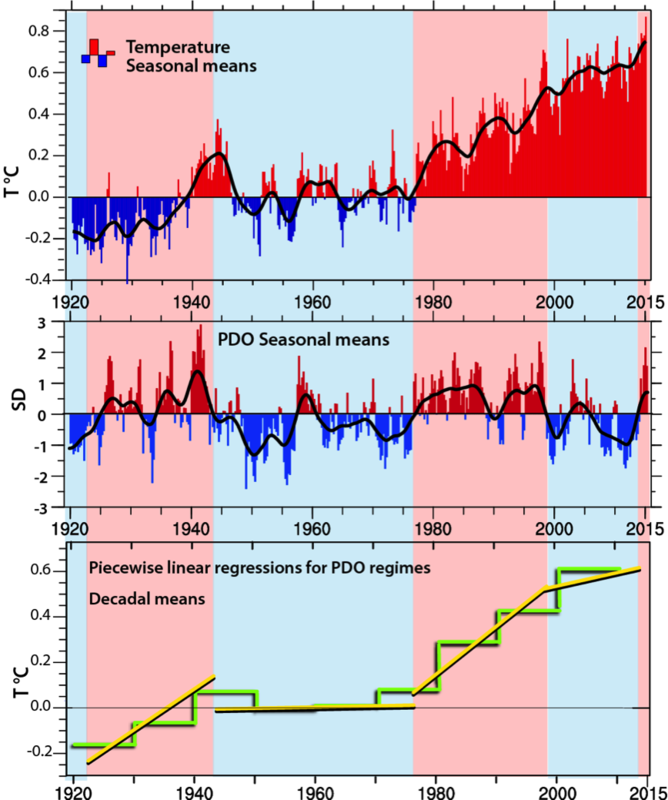 The PDO is part of the Interdecadal Pacific Oscillation (IPO) that has implications for the global energy budget via Rayleigh-Bénard convection – as in the Max Planck Institute link above. But evident in TOA energy flux. It results in changes in the outgoing energy flux of the planet and modulates long term heat accumulation in oceans dependent on long term changes to the mean Pacific state especially. Kevin Tremberth asked if the hiatus is over. The gyre hypothesis is that solar mediated polar surface pressure anomalies drive ocean circulation in all the oceans – and upwelling in the eastern Pacific. The hiatus is about to start – within a decade perhaps as the sun dims and climate shifts again. If it is not happening now. An incredibly important question and I believe, a largely ignored question. Thinking about it more, maybe one of the most interesting questions since there might be some unknown unknowns lurking out there. Small changes in the complex dynamical Earth system drive large abrupt changes in response. It is the nature of deterministic chaos. It is suggested that Hale cycle of solar magnetic reversal drives 20 to 30 year periodicity in the resonant Earth system. Very little is known of the ‘control variables’ that bias the system to one state or other or the multiple interactions of powerful subsystems that shift the system to a new state. But this is the dominant Earth system paradigm. I’m interested in your thoughts about what caused the warming during the Roman Warm Period and the MWP. For the sake of discussion I would like to set aside the usual debate about the amplitude, synchronicity and global coverage of the previous warm periods and, if you agree, stipulate that some warming took place in some parts of the globe for some extended periods of time. If there was warming regardless of where, timing and amount for those periods, what do you see as the mechanisms or causes at play? Can we also agree that no global warming occurred to any significant degree as indicated by the negligible changes in sea level from geology and eclipse records and the slightly increasing land ice mass balance during the Holocene. Moberg and Grinstad show some increase in SLR. Of course, if those geology records have spatial coverage as poor as most other paleo reconstruction studies, what does it prove. Every year more evidence surfaces that some warming occurred in more and more regions. If people in 100 years only look at Huston & Dean, Parker and Watson and some others, they could ask what Acceleration in SLR during the Modern Warm Period. What warm period. If the looked at Sydney and many other records of tidal gauges they could ask the same thing. There are too many uncertainties and very incomplete information of the past to have the level of confidence imputed by some. This may be true, therefore I stressed the limitations of the described method: “A postulate is included: There are no other contributions than described in the introduction section, perhaps longer lasting, so that we can’t identify them.” The time window of the application was also described: 1950…2016. I can’t answer your questions reagarding the MWP because this is beyond the scope of the mainpost. Yes, I understand. Thanks for your post. Notwithstanding emerging difficulties with the bubonic explanation of the Black Death and hence a generally more holistic approach in recent years, the following is a much simpler alternative that also seems to me less challenging to the imagination than Dobler’s very wide ranging / dramatic scenarios. The great advantage of the dobler link is that it is very interesting, can be read in its entirety for free, unlike the book you link to which needs to be bought. Is it about climate? Needs sifting through, but provides plenty of links to the date-climate-food link over a wide geographical area. The plague is a resulting after-effect. Yes, I found the Dobler work interesting too, but indeed a great deal of it partners / justifies an explanation for the BD, as the first two words of its title clearly indicate. Hence the alternate theory above is most certainly relevant to post. And indeed if there is another robust theory that explains the emerging questions without a main recourse to climate, we might down-weight somewhat our evaluation of a climate theory that is so entangled with BD explanation. No, the Scott / Duncan work is not about climate, and not free, although as far as I recall there’s some snippets of it around (sorry I have no links), and the theory has (or had) a mention in the wiki page for the Black Death. There is a link between climate and failed harvest to famine effecting both humans and rats (field and sewer). I find the discussions of Younger Dryas most interesting. Among many other mentions, it said. The Greenland ice core data clearly shows these abrupt cooling and warming after. These temperature pulses do not show up in Antarctica ice core data. This supports the idea that the cooling events were causes by Melt Water Pulses and the rapid warming after were caused by mixing with the much larger oceans. The sea level rise did happen in the oceans in both hemispheres because oceans are connected. The cold Melt Water only entered the oceans in the Northern Hemisphere. This supports Ewing and Donn who said the great ice sheets thawed and thinned during the long cold period and were thin enough to start retreating twenty thousand years ago. There was no sudden warming that caused the ice to suddenly melt and retreat. The warming was caused by the ice retreat. The ice chest gets warm after the ice has thawed and depleted. The great ice sheets allowed warming after the ice had depleted and started to retreat. Consensus ice volume and extent theory is extremely thawed. They say max ice volume and max ice extent were in lockstep phase with each other. That is impossible. Glaciers advance fasted when volume and weight are max. Glaciers stop retreating after volume and weight are reduced when extent is at a max. Glacier advance causes colder and glacier retreat causes warmer. Glacier advance is caused by more snowfall than thawing. Glacier retreat is causes by less snowfall than thawing. Ice sheets work the same way. Long term internal cycles of warm times when oceans are more thawed and cold times when oceans are more frozen alternate to add and remove sequestered ice to maintain the balances. Every one is studying immediate correlations and no one is looking at longer term internal cycles. All dynamical systems have internal cycles that are activated by external forcing, and sometimes the external forcing is in phase with the internal cycles and sometimes it is not. No on understands why that only some Milankovich cycles cause a climate change and others do not. They do not understand because internal cycles are what is really happening and they do not even recognize internal cycles exist. An ice age happens when there is enough ice. An ice age ends when the ice thaws and is depleted. These starting and endings always correlate with some external change that gets the full credit. It was only luck. All the external factors work together and against one another at times. The internal results include immediate responses and long term responses. Everyone studies the immediate responses and wind up saying, we really do not know, it must be chaos. Frank: I liked this post. However, I wish the index for ENSO was decoupled from overall warming. The oldest index was based on the atmospheric pressure difference between Tahiti and ?. That pressure difference drives the shift in winds from east to west to west to east and the amount of warm water moving east. Atmospheric pressure is conserved; it doesn’t drift with global warming. Frank: Thanks for standing by and lining out some basics for some disputants. I appreceate your positive feedback. The index SOI ( delta p Tahiti/Darwin) is very volatile and influenced also by the Madden Julien Oscillation. 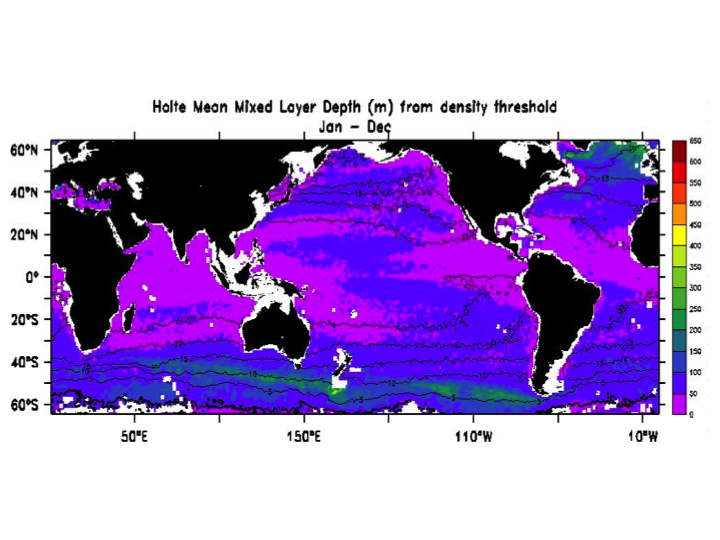 Therefore the MEI also takes advantage from the SST (i.e. Nino3,4) which are also forced. “Tamino” used this index ( as many others IMO) without mentioning the forcing. It’s a small amount however I mentioned it for completness. And Christie (!) 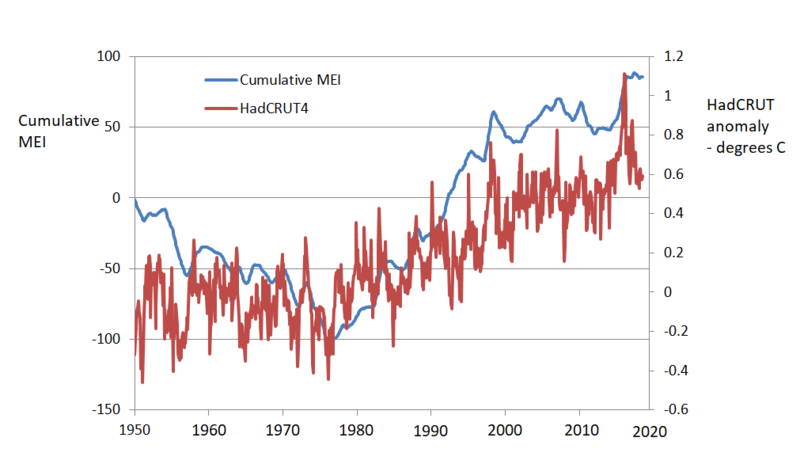 used a “cumulative MEI index” to prove that global warming wasn’t driven by radiative forcing! IMO, things would be cleaner with a proxy based on the SOI. Could you smooth out the 2-month? MJO and retain the ENSO signal (6+ month? rise and fall)? You know what you are looking for: something with a high correlation to the MEI without the baseline drift and possibly leading the MEI slightly since it take some time for the winds (theoretically driven by the pressure difference) to move warm water to the east. I presume that warmer water in the Eastern Equatorial Pacific transfers heat to the atmosphere and that air warms the rest of planet. Again, a slight lag is likely. There seems to be an assumption here that the “multi-decadal signal” represents internal variability. I would suggest you try applying this procedure to the CMIP5 mean. You’ll find the same pattern. To the CMIP5 mean? This shows nothing else than the modeled forced GMST IMO because all variationes introduced by single models and runs will be cancelled out. Yes, exactly. Which would suggest that the multi-decadal variability pattern identified here is forced, not internal variability. I made the same operation with the same areas described in the mainpost. Which suggests that the pattern is indeed internal variability. No, I mean the residuals in the global average. Apply the Tamino filter (minus ENSO) to the CMIP5 mean global average, regress against forcing and find the residuals of that regression. The (multi) decadal signal was the difference between the NA and the SO as it was stated in the main post, NOT ENSO influence, solar- and volcano forcing (tamino filter) , which is not (multi) decadal. Therefore you should admit, that the “multi decadal signal” is not a product of the forcing as you estimated but indeed internal variability as I showed it in the figure above. Thanks for beeing patient. ‘The residuals of this regression contain a (multi) decadal signal’. The cause of multi-decadal variability in the sub-polar North Atlantic (and I believe it is basically the North Atlantic doing the work in that NA-SO equation) is probably a complex topic. Obviously there will be some internal variability in this region, but the particulars of the multi-decadal pattern people tend to talk about show strong correlation with timing of volcanically-active and volcanically-quiet periods. And there’s been a lot of work in the past few years on the link between volcanic events (plus anthropogenic forcing) and North Atlantic variability. As you point out, climate models are at best equivocal about a strong volcanically-forced signal in the sub-polar North Atlantic, but some do show a similar pattern. It’s quite plausible there is some regional dynamic response to volanic forcing that the models are missing. I would think events of the past decade should give pause to those who believe sub-polar North Atlantic internal variability is really driving much at the global scale (at least in the direction usually implied) given that surface temperatures there have plummeted at the same time that global average temperatures have risen rapidly. Paul, your statement:” I would think events of the past decade should give pause to those who believe sub-polar North Atlantic internal variability is really driving much at the global scale (at least in the direction usually implied) given that surface temperatures there have plummeted at the same time that global average temperatures have risen rapidly.” shows some believing in short term noise ( “past decade”). I showed that this (multi) decadal signal is at work on longer timescales ( after 1950 at least) to mute/amplify the anthropogenic signal and also the last decade ( after removing ENSO) follows this line. However, thanks for this inspiring dialogue which seems to be wishfull for bridging the “blog frontiers”. What make you think any AOGCM has the ability to realistically reproduce internal variability? They all struggle or fail with known phenomena. Unless something has changed recently, we still can’t predict the next El Nino more than 9 months in the future with even the most sophisticated models designed to deal exclusively with this problem! The multi-model mean is even worse. If a subset of models produce some form of AMO with a period of a 65 years, unless you properly initialized them in phase, they would simply smear the signal out. Now complicate matters by assuming they deliver periods ranging from 50-80 years and start even slightly out of phase. Frank Bosse, thank you for the essay. Matthew, it was my pleasure albeit the one or other disputant here was not so happy with it. Frank, Have you done the same thing using 1980-present? dpy: I tried it but I’m afraid that the data quality is too limited ( especially for -50…-65N; 70…-70E) to applicate the procedure before 1950. The HadSST datasets have big gaps and I’m not quite sure how ERSSv5 manages the set back to 1850. And this (multi) decadal signal is the core of the post, therefore I would not recommend to overlook the big, big uncertainty before 1950. I meant 1980 to present NOT 1880.
dpy: sorry for missreading! I did it in between and when one estimates the TCR from the regression of the GMST (C&W) vs. the anthropogenic forcings for 1980….2016 one gets one gets TCR=1.77. If one applies the method described in the mean post one gets the best coincidence between the raw data and the reconstructed time series with the mentioned equation (1). The TCR is not 1.77 but 1.3 with the consideration of the internal variabiliy. Thanks for pointing to this. dpy: btw, this is what fig. 4 of the mean post shows :) however I tested it in a different way which is good. Thanks Frank, that confirms a comment at SOD that you may have been the author of. It makes sense that longer time frames are more immune to internal variability. The assumption that C&W version of a GMST is correct is a big one. It ignores the great likelihood of errors in the adjustment of temperature data. See chapter 9 of the audit of the HadCRUT4 dataset for details of the likely errors. jdmcl, In the meanpost gave the link the paper describing the C&W dataset. Referencing a paper doesn’t automatically mean it’s reliable. National meteorological services now do their own adjustment – which makes sense because they know more about the conditions – so if they have incorrectly adjusted the data before supplying it to other people then any processing of that data that those people do will also be incorrect. The surface temperature estimates like C&W are triple proxies at best. First, they are sampling the boundary layer, not the atmosphere, where the CO2 warming effect must occur, if it even does. Second, there are no fixed stations for most of the Earth, especially in the oceans, so distant measures are being treated as fixed stations. Third, in many cases it is water temperature not air temp that is measured. Then too the satellites tell a very different story. Oh and this surface stuff is a convenience sample, which statistical sampling theory says cannot support a conclusion about the overall population. Proxies by their nature introduce uncertainties. In this case the uncertainties are both compounded, and contradicted. Therefore clams based on detailed regression analysis are spurious at best. Consider this a peer review. “Consider this a peer review.” I would if you were a peer! What does it take to qualify as your peer? Agreeing with you? Sorry, but I cannot do that. Does my Ph.D. in epistemology and 25 years experience in analyzing the climate debate help? David, It’s your choice not agreeing with some very basic thoughts. You seem to think up to now ( your “review” post implies this) that “satellites tell a different story” than the GMST albeit it is shown that this is not the case. It’s also your choice to introduce some kind of authority bias. However, you are not a peer in climate science. This small article was not thouhgt for peer review, so please don’t try to review it. Neither the peer nor the review are appropriate. “I don’t agree” is enough. Thanks for your patience. Just to be clear, epistemology is the study of the nature of knowledge. My point here is that your procedure is based on several implicit knowledge claims that are not supportable. My point is epistemic. Perhaps you have failed to grasp this. Uncertainty has been my field for many years. What is your field? David: It’s enough to state: I don’t agree. It’s your choice. Disagreement is fine, Frank. But that does not make me not your peer or not a climate scientist. Regarding the latter, as far as I know I am the first to publish the finding that there is no GHG warming in the satellite record. Sure sounds like climate science to me. If you disagree with my finding, please say how. David: my last comment to your side:” no GHG warming” in whatever is an oxymeron. Due to the name! Frank, I have no idea what your oxymoron claim is about. If the only warming in the satellite record is due to the giant El Nino, then there is no GHG induced warming. Seems perfectly clear to me. I think it is important to point out that most of the climate change scientific debate is about epistemic questions, not physical questions. How accurate are climate models? How accurate are paleoclimate proxy reconstructions? How accurate are global statistical claims? These are all epistemic questions. As Judy states in response to your words: ” How accurate are climate models?” Please re-read the mainpost with this in mind! Answers to any of those questions require knowledge of methods and their limitations – geophysics rather than metaphysics. How accurate are climate models, paleo data, ocean heat content data, and TOA incoming/outgoing? With ECS still not well constrained what good is it? Know >>> Act. Know has to be at a high enough level to Act. Or it’s reckless. Some of the best knowledge we have is what we can do in the United States in regards to mitigation is going to have a small impact and with current technology is going to cost a lot. Then we could argue we have duty to the world. That’s not physics. The higher valued knowledge of economics as compared to the climate science, tells us to adapt and this is still not physics. So physics is telling us we aren’t really sure. But economics tells us it sure costs a lot. David Wojick: I think it is important to point out that most of the climate change scientific debate is about epistemic questions, not physical questions. How accurate are climate models? How accurate are paleoclimate proxy reconstructions? How accurate are global statistical claims? This point is made over and over again. Models have irreducible imprecision for reasons many cannot seem to comprehend. All paleoclimatology has methodological limitations. Modern data is as precise and comprehensive as it can be – albeit with short records. And not widely appreciated for what it is. But the Earth system is a wild and angry beast in all of it. Peers are people who have committed to the same thing and reject all else. These are people who have accepted the same extreme alarmism that you have accepted. By definition, if someone disagrees they are not your peer. This is the way peer review works. This works 97% of the time because it takes time to kick the 3% out. Peer reviews by people who disagree do not happen. Those people are kicked out of the peer group. VTG, my opinions are not influenced by my patrons, quite the contrary. As for my well founded beliefs somehow being deliberate misinformation, you are a fool to even suggest this. Are you claiming that I do not believe what I say? Seriously? Both of your claims are clearly false. I deliberately misinform no one and I do lots of research. What are we to make of your glaring errors? vtg: “I realise this post will likely not stay up long, these truths are not welcome.” I think it will. Because the truths in the mainpost ( summerized in the last sentence of the conclusions) are IMO thruths that should be considered. This post stays, your others have been deleted. Attacking a commenter is not allowed, attack the arguments instead. The multidecadal link between the Pacific state and surface temperature is via shortwave modulation of ocean heat content through cloud feedback. I suspect what is going on here vtg, is the moderating of ad hominem comments and trying to keep off her blog the familiar political hatchet job tactic of quote mining someone’s vast public record for anything offensive to be used to discredit them forever. Very few take seriously this idea that CO2 increase is not due to fossil fuel use. There will always be some who believe it but its completely unimportant to have perfect unanimity. Trying to drive an idea out of the public square is not going to work and is a waste of precious life energy. Frank’s post here is very interesting and shows something very interesting I think, namely, how important effective forcings are for estimating TCR. It also shed some light for me on how climate models can disagree so much with historically constrained energy balance methods. Elsewhere Frank (perhaps another one) pointed out that effective forcings in climate models vary over a surprisingly broad range. Further a high aerosol negative forcing can compensate for a high TCR and allow a model to replicate the historical global mean temperature by essentially cancellation of errors. Similar observations apply for ocean heat uptake which is too high in models according to this Frank. Pingback: Weekly Climate and Energy News Roundup #342 | Watts Up With That? I have read your post, Frank Bosse, aka frankclimate, and although I have not studied it in detail or claim to understand exactly what your methods are, I would like to comment here on some analysis I have done using an Empirical Mode Decomposition version called ceemdan with regard to noise and quasi-cyclical structure in the CMIP5 modeled and the observed GMST series. The ceemdan method is wholly empirical and requires no assumed parameters in the decomposition of a time series and that characteristic provides this method with some advantage over other decomposition methods. However, the cyclical estimates found in these series and especially the longer period ones are not at all well understood. 1. 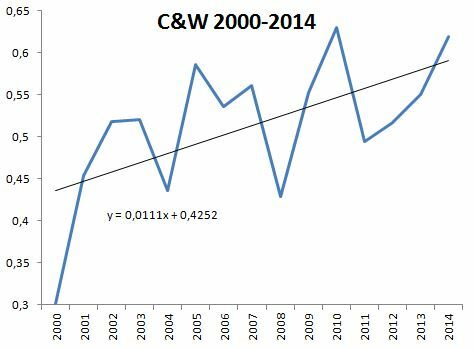 Both the observed (Cowtan-Way and HadCRUT4 v5) and modeled GMST series during the historical period yield multidecadal variations that are not part of the secular trend. I see in the range of 3, 10, 20, 30 and 60 to 70 year cycles. 2. The CMIP5 model GMST series in the post historical period have different cyclical character than in the historical period. The series in both periods are not statistically different in character otherwise. 3. The CMIP5 models pre-industrial control (pic) series do not show any statistically significant cyclical structure. 4. While the decomposition of the observed and modeled series during the historical period yields trends that are less (approximately 30% less) than trends determined without decomposition, the estimates of TCR and ECS would not differ significantly from those derived in Lewis and Curry 2018. In other words a judicious selection of time periods can “cancel out” the effects of multiple decadal variations and volcanic events. 5. With ceemdan analysis the CMIP5 model ensemble has an average temperature trend for the historical period slightly greater than that for the observed series – when a combination of the tas(surface air temperature) for land and tos(SST) for the oceans is used for the models. In this comparison, since the observed is essentially a combination of sat and tos, it is more apples to apples. 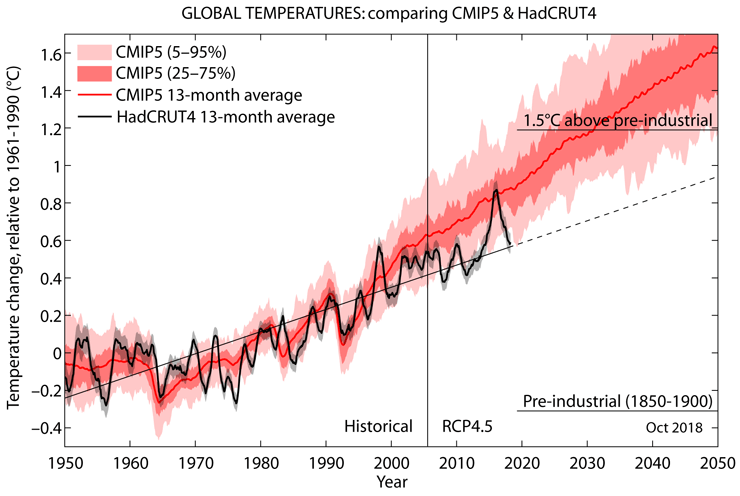 Nic Lewis has made arguments that perhaps the difference that the models see in this case is not the same as that for the observed, although the amount of observed global sea air temperature data is limited. 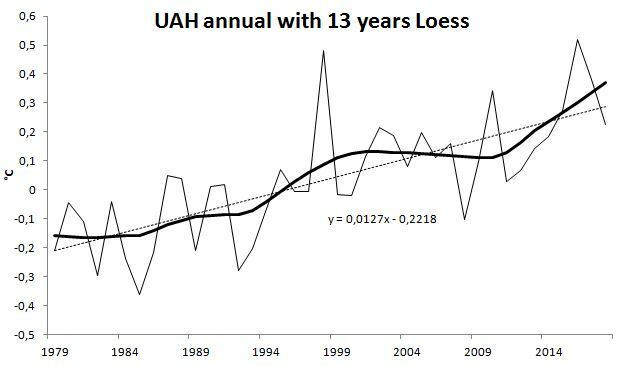 When the sat temperatures for land and sea are used in the modeled global temperature the trends tend to be on average approximately 20 percent higher than when the combination is used. 6. If ceemdan trends for the published forcing, ocean heat content (OHC) change (or the net TOA radiation) and global temperature series is used, the approximate same ECS (or better the feedback parameter) values are found for those for the observed and CMIP5 modeled that are reported in Lewis and Curry 2018. If the combination global ceemdan temperature trends are used for the modeled estimates those estimates will be 20% lower than the all sat case. Most of the difference between the model ensemble combination average and the observed in this case then has to be due to the differences in the changes in forcing and OHC used in the estimates. 7. It is important to remember that when the model ensemble average is referenced there are significant differences between individual models where models have multiple runs that can make the statistical comparison possible. 8. Recent ceemdan analysis of mine with RCP 8.5 CMIP5 model runs from the historical period through to the year 2300 show that the estimated feedback parameter decreases (higher sensitivity) on average something less than 10% over the long term (2100 to 2300). This change is in good agreement with what was found in Lewis and Curry. I am in the process of looking at just how well my results are in agreement with the 4XCO2 CMIP5 experiments. I am only interested in my analysis for learning for own benefit and perhaps encouraging someone in the field at looking in depth at applying my methods or at least evaluating them. I liked some of the questions and replies on this thread concerning issues where there are not good answers yet supplied by the science and the assumptions that are currently required to make some of these comparisons. It is too bad that personality infighting has to detract from those important discussions. I do agree with this. But I also think many are CERTAIN about the future. Which is more funny? Being certain about the past or being certain about the future. My bias says it is more funny to be certain you know what will happen in the future than to think you knew what happened in the past – but YMMV. 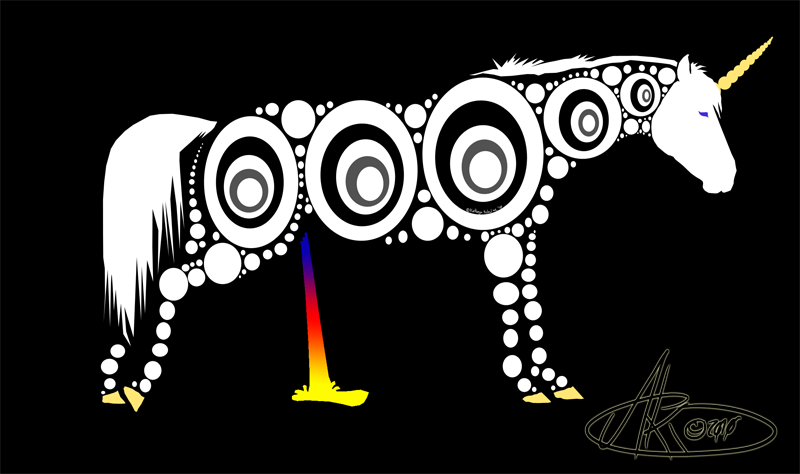 You can lead a unicorn to a black swan or dragon-king – but you can’t make him believe. It is the signature of low level cloud variability – much of that associated with cloud changes anti-correlated with SST in the eastern Pacific. See citations herein. So we have simultaneous ocean and atmosphere warming and cooling in response to ENSO – not just a transfer of energy between oceans and atmosphere. This makes the linear regression of MEI against temperature of Folland et al, Tamino and Frank a complete nonsense. What is needed instead is a procedure that uses cumulative MEI as a proxy for changes in ocean energy content – which correlates with surface temperature with much of the ‘noise’ built in. This makes for a very substantial difference between mean model results (LOL) and observation in the Kravtsov et al 2018 study. And to imagine that these multi-decadal changes operating through the Global Stadium Wave (GSW) are periodic beyond the 20th century is magical thinking. So not to put too fine a point on things – what do I think of this post? Yep, we can agree. My views resemble yours over much of what you have just written here. IMO, there is far too much time spent dreaming about how to manipulate figures (figures that in some combinations do have rainbow unicorn form) when for many decades now the basic data contributing to these figures is unsound. Unsound, untested and unfashionable to discuss. Last month, I fiddled away with some thoughts about Urban Heat Island. My conclusions are not compatible with those of Frank Bosse. If my conclusions are correct, his cannot be, and vice versa. Most of my conclusions can be tested by those with funds to do some experiments that are simple to envisage and execute and should have been done by now.. I am not sure if this applies to Frank. I really do not endorse anything that Sherrington says. Perhaps more relevant than the unprovable volcanic cause of the little ice age. Whatever data we have is freely available – so knock yourselves out. 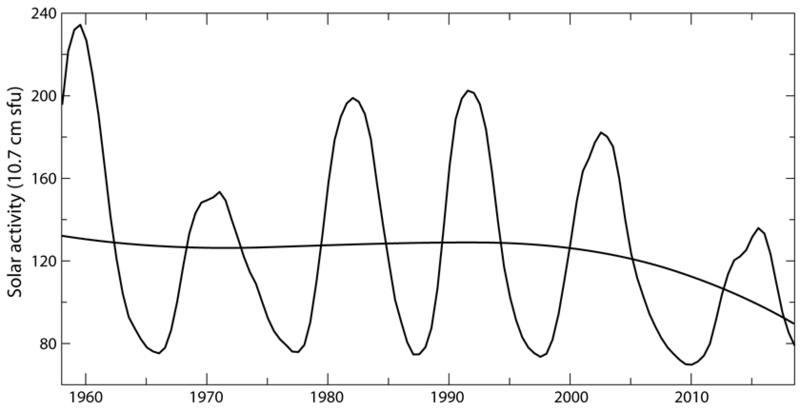 Abrupt changes in the Pacific state seem related to solar modulation of polar annular modes. Changes in locations of wind and storms influence temperature in lower latitudes, Pacific upwelling and AMOC. Pacific SST modulates cloud cover and the global energy budget. Pacific SST shifts at millennial scales. Abrupt change is diagnostic of deterministic chaos in the dynamical complexity of atmosphere, biosphere, cryosphere, hydrosphere and lithosphere that little minds fail to grasp and seek to mock. But it is overwhelmingly likely that the joke is on them. As I said – but unless there are plausible physical mechanisms and data then it is just another half arsed narrative. I have left enough clues about the place as to the what, how and implications for the future based on ideas and results of hundreds of studies. JCH calls it my Frankenstein theory. Mosh in the zombie thread joins the chorus of those waffling about cutting and pasting. There is a rational response if they truly believe that I selectively quote. Read the studies if they have any capacity to do so and reveal to the blog the correct interpretation. They can’t do that because their belief that science is a monolith wouldn’t survive – or because they pretty much have zilch capacity. That’s an idea for an article – none of it original science. I’ll call it my Frankenstein climate theory. No pun on Franks ideas and methods that are decades behind the curve. This is how it works btw – polar annular modes and the gyre hypothesis. Javier mounts an impressive defense for natural climate variability dirven by the sun. I have learned something important about nature and the earth that I did not know reading this threat (and soon to be re-reading it) – not that I haven’t been impressed before about Javier’s depth of knowledge (I have been before). But this time and place marks out a new level of personal appreciation by me. It is easy to fall prey to reductionism in science and especially in the earth sciences. A single factor variable that “explains” too much? Nonsense! That’s the core driving motive behind much of the groupthink that surrounds the “greenhouse gas dogma,” as geophysicist Tom Segalstadt dubbed it. I believe Javier shows us more about the levels of complexity climate changes reveal to us. Just read and listen carefully. You too may learn something new and wondrous. The author misunderstood all the things beeing done in the mainpost! It’s really silly IMO. Some comments tried to rectify it, however the failure stands. And some comments (i.e. https://tamino.wordpress.com/2019/01/04/global-temperature-adjusting-data-cowtan-way/#comment-103235 were not aware that the mainpost used the climatology of 1981…2010 instead of 1961…1990 used in the original C/W dataset, which changes nothing of the conclusions: TCR=1.27 from observations, the cited comment confirms this. Don’t overestimate the skills of some climateers… this is the take home message! Yes Frank, the childish nature of the commenters there is annoying.